At RUTHMANN, we are able to look back at more than 116 years of documented history. It all started when Anton Ruthmann founded the company in 1901. Together with a partner, he opened a bicycle and sewing machine shop. After two world wars, the second-generation Ruthmann family took over control of the company. RUTHMANN had been developing and manufacturing pushcarts and trolleys for many years but in 1949 the company introduced the first CARGOLOADER ® (Hubwagen). In 1965, RUTHMANN developed the first CARGOLOADER® with an interchangeable cargo area to be used professionally as a container system. Today the CARGOLOADER ® exemplifies an ultra- modern goods distribution system for frequent loading and unloading on short to medium routes. It offers a cost-saving potential of up to 40%, compared to conventional transport systems (trucks with tail lifts). In 1954, the groundwork was laid for the success that RUTHMANN enjoys today. 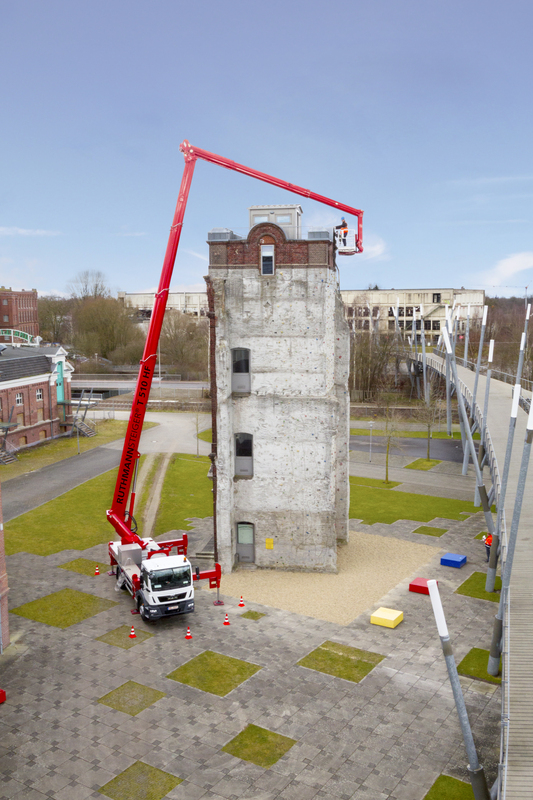 The company developed the first STEIGER® aerial work platform which it sold to the city of Duisburg, Germany. With this step, growth, modern technology, and globalization became the company’s main objective. To this day, RUTHMANN continues to set new standards in performance data excellence and innovation with its STEIGER® aerial work platforms. As market leader RUTHMANN's products also included the most capable STEIGER® model in the world with a working height of 100 metres. For decades, the STEIGER® brand has been a synonym for aerial work platforms in Germany. In Germany, our products are sold directly to the customer. Worldwide clients are served through the company’s international sales and service partners. Our customer base includes municipalities, power, logistic, and industrial companies, craftsmen and rental companies. In addition to selling first-class products, our company success and satisfied customer base can also be attributed to our excellent after-sales service programme. In Germany, Austria, France, Italy and Switzerland we have 11 factory-owned service stations, 13 service points (additional customer support stations), and mobile workshops available to serve our customers. We offer the BEST and BIGGEST service network in the industry! Fast, competent, and reliable. Our mobile service vehicles are equipped with the most important technical documents, tools, and spare parts to allow our service technicians carry out their assignments with utmost efficiency. Worldwide clients are served through our international sales and service partners. In 2003, Heinrich Winkelmann (majority shareholder) and Heinz-Jürgen Buss (shareholder) became the new managing directors of the company. Their plan to modernize the company was implemented perfectly. RUTHMANN became more customer oriented and adopted leaner construction and production procedures through new development and fabrication techniques. In 2008, RUTHMANN FINANCE GmbH & Co.KG was established. Acquiring RUTHMANN products through our affiliate has never been easier. In Germany, FINANCE provides convenient alternatives to traditional purchases of RUTHMANN products. TheCLEVERRENT long-term rental agreement for example, is ideal for municipalities and power companies. The newestRUTHMANN models with cutting edge technology are available without straining household budgets/company balance sheets. Customers avoid having to tie up large amounts of capital and there are no costly vehicle-related administrative costs. With CLEVERUSED, RUTHMANN FINANCE offers buyers (and sellers) one of the largest selections of used aerial work platforms (STEIGER® and competitor brands) and CARGOLOADER ®‘ vehicles in Europe. In June 2010, Heinrich Winkelmann and Heinz-Jürgen Buss handed over the company reins to Rolf Kulawik in order to oversee operations at Winkelmann Group GmbH & Co. KG in Ahlen, Germany. Both men are still owners of RUTHMANN however. Rolf Kulawik had been our General Service Manager since July, 2009. He looked after our company-owned service stations in Germany and Austria as well as our global service partners. Three other highly-experienced team players – Uwe Stapper, Uwe Strotmann and Dr.-Ing. Nico Krekeler – assist Mr. Kulawik with his managerial duties. Our successful management team. 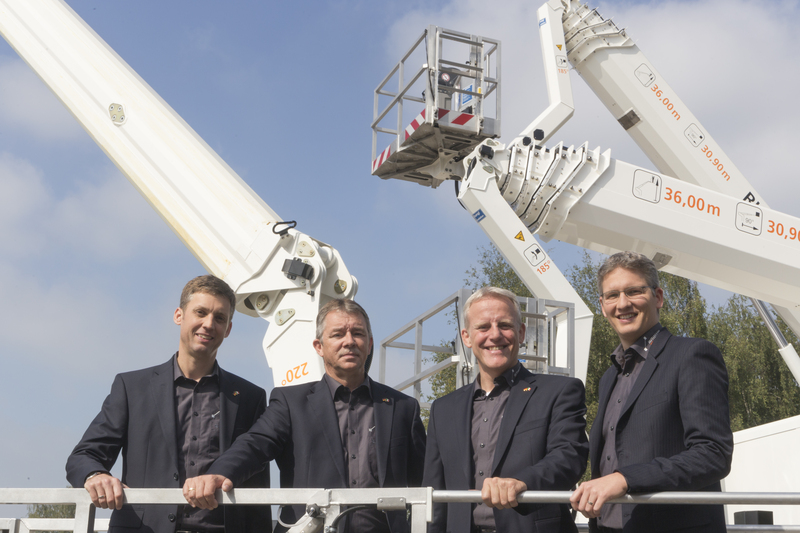 Pictured here (from left to right): Uwe Strotmann (general manager), Rolf Kulawik (managing director), Uwe Stapper (general manager) and Dr.-Ing. Nico Krekeler (general manager). From 2008 – to 2010, we managed to crack the 50 million EURO mark in sales despite the global economic crisis. In 2011, RUTHMANN acquired Time Deutschland VERSALIFT GmbH along with the distribution rights of VERSALIFT® products. This has greatly enhanced RUTHMANN’s work platform product range in Germany, Austria, and Switzerland. For maintenance and repair purposes, VERSALIFT customers benefit from RUTHMANN's market-leading service and support network. VERSALIFT® is a trade mark of the TIME Manufacturing Company, based in Waco, Texas, USA. TIME designs, produces and sells truck-mounted work platforms all over the world. In Europe, VERSALIFT® work platforms are made and sold by TIME Danmark A/S. TIME is the world's largest manufacturer of truck-mounted work platforms, specialty vans, and insulated aerial platforms. In 2011, we also joined the NRW (North-Rhine Westphalia) Industrial Acceptance Offensive Under the motto, INDUSTRY – together, future, life”, we work with other manufacturers in the region to promote sound and responsible business practices. In 2013, we adopted the motto, “RUTHMANN active”, which reflects our ongoing commitment to the health and well-being of our employees at the workplace. Goal: Healthy employees increase overall efficiency and productivity. In addition to sport activities (overall fitness), the programme also includes work safety, ergonomic workplace design, and addiction prevention. In September 2014, we were a finalist in the “Grand-Prix for Medium-Sized Enterprises” and in 2016 we were the winner of the entire contest. Since its inception in 1994, the annual “Grand-Prix for Medium-Sized Enterprises” – organized by the Oskar Patzelt Foundation – has become the most important competition for medium-sized businesses in Germany. The judges were impressed with the excellent overall development of our company, the creation and safeguarding of job/ apprenticeship positions, as well as exemplary performance in "innovation/ modernization", "commitment to the region" and "service/customer orientation/marketing”. 2012 - 2016 were the best years ever for our company. In 2013, the RUTHMANN Group recorded more than 104 million Euros in sales revenue. In 2014, total sales increased to a record 109 million Euros. In 2015 recorded almost 114 million euros in sales and in 2016 we generated sales of almost 143 million euros. For the current fiscal year, the many orders on hand and incoming orders are an early indication that sales figures in 2017 will remain robust and could very well surpass the record turnover enjoyed in 2016. The fact that we have been able to quadruple turnover in 10 short years, is a monumental achievement. The picture shows one of RUTHMANN's latest innovations relating to truck mounted aerial platforms: The highflex STEIGER® T 510 HF. The revolutionary, world champion performance specifications are what make this STEIGER ® model so special: 51 m working height combined with 33 m outreach, which - coupled with a 2-axle chassis – can be found nowhere else on the working platform market. Such performance data were previously possible only on a 3-axle chassis. are number 1 in Europe and rapidly strengthening our presence and image all over the world. are leaders in technology and provide best-possible sales and service solutions for maximum customer satisfaction. are continuously optimizing our business/manufacturing procedures and continue to accelerate digitization efforts within our organization. are an equal opportunity employer and support the ongoing development of all our employees. prioritize the health and safety of our employees and operate in an environmentally-compatible and sustainable manner. constantly strive to improve our steel fabrication techniques and provide maximum customer benefits. are committed to strong values such as reliability, honesty, credibility, and integrity. Regulatory compliance is a matter of course for us.